Severe fires, unprecedented bark beetle infestations, heat and drought – all exacerbated by climate change – are killing trees throughout the Rocky Mountains. So whether you’re a fan of New Mexico’s piñon pines, Colorado’s aspens or Montana’s whitebark pines, the West’s forests could look radically different in 50 to 100 years. That’s the message of a report released last week by the nonprofit Union of Concerned Scientists and the Colorado-based Rocky Mountain Climate Organization. The authors want people to see dead trees as a tangible reminder of what’s at stake as we continue to mess with the atmosphere. Average yearly temperatures in Rocky Mountain states have increased about 2 degrees Fahrenheit since 1895. If emissions continue unabated it could be another 3 degrees hotter by mid-century. That means what already seem like “serious jolts to forest ecosystems could be very mild compared to what we could see in the future with greater changes,” said Jason Funk, a senior climate scientist for the Union of Concerned Scientists. Since 2000, bark beetles have killed enough western forests, like this one in Wyoming, to nearly cover the state of Colorado. Photo by Roy Renkin, National Park Service. Aside from providing current stats that you can use to scare your friends at the bar (Did you know that bark beetles have killed enough forests in the past 14 years to nearly cover the state of Colorado? 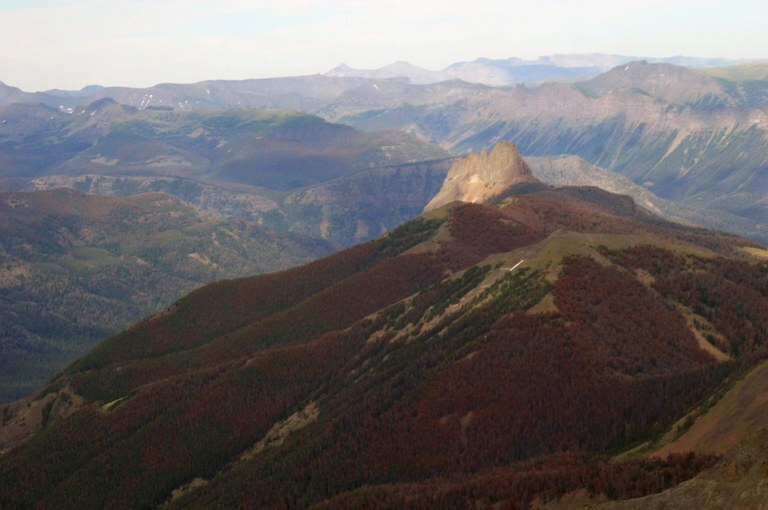 ), the report contains some new projections about how inhospitable the Rocky Mountains could become for familiar trees. According to the report, 90 percent of the acres where today the climate is suitable for lodgepole pine will become unsuitable for the species by 2060 if current emissions rates continue. This doesn’t mean that 90 percent of the West's lodgepoles will die, but it does mean that much of the habitat they occupy today will not support them by 2060. Aspens will lose 60 percent of the acreage that supports them today and ponderosa pines will lose 80 percent. These startling numbers come with another big caveat. These “climate envelope” models contain huge amount of uncertainty, in part because they assume that climate is the single most important factor in determining where a species lives, and they don’t account for many other aspects that matter for survival: plant physiology, short term variation in temperature and precipitation, interaction with other species, or local geography. Even the report’s authors discouraged focusing on the precise numbers. Instead they suggest using them as a reminder “that if we keep changing the climate the way we are, we could be very fundamentally changing the nature and the extent of the forests in the Rocky Mountains,” said the Rocky Mountain Climate Organization’s president Stephen Saunders. However, some experts on climate change and ecosystems think the report, especially the projections, paint a “worst case scenario.” That’s partly because actual responses to climate change are going to vary a lot based on local conditions. “I think the challenge is going to take this info and make it meaningful at local and regional scales,” said Dave Peterson, a research biologist with the Forest Service’s Pacific Northwest research station. That’s what Peterson and others in the Forest Service have been trying to do, to help the agency plan for and adapt to climate change. For example, Peterson said that fire “may be the biggest ecological story that we have (for forests) in the coming decade.” As the West has become hotter and drier, wildfires have become more frequent. Compared to the gradual ecological changes brought on by rising temperature or even insect blight, fires quickly reset vegetation, clearing the way for rapid and large-scale changes. This may be especially true in the Southwest where forests may not regenerate after large disturbances, and could be replaced by grassland or shrubs. To increase resiliency to climate change, managers might do larger prescribed burns to create mosaics with different species and ages, instead of same-aged monocultures of trees that are more vulnerable to fire or insects sweeping through them.